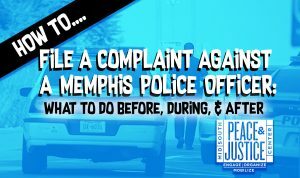 Are you trying to file a complaint against a Memphis Police Officer? Back in 2012, we first documented the process and barriers we observed when filing a complaint against Memphis Police. Since then, we’ve assisted many others in trying to navigate the process in search of justice. While this should in no way be taken as a substitute for advice from an attorney, here are a few lessons we learned along the way…. Before you file, be prepared. We recommend that you write out a detailed narrative of events related to your complaint BEFORE you file. That way the details of what happened and the order in which they occurred are fresh on your mind. Think about “the five W’s” of filing a complaint: Who, What, Where, When & Witnesses. What time was it when the event occurred? What did the officers say and do? Did you observe their name or badge number? Were there any witnesses or was there any video footage that can corroborate your narrative? Gather as much information as you can to bring with you. Knowing The Rules: Investigators with ISB use MPD’s Departmental Rules to evaluate complaints against Memphis Police Officers. Although we have been told differently by officials with MPD, these Departmental Rules are NOWHERE to be found through the Internal Services Bureau or the websites of the City of Memphis or MPD. Here’s a link to the Departmental Regulations that are supposed to be used to evaluate complaints, that we have obtained as of 2016: MPD Policy & Procedures Section: RULES. You can use these to inform the basis of your complaint. In our experience, not having these Departmental Rules at your disposal makes it harder to ensure that investigators are evaluating your complaint under the appropriate regulations. Expect to be there a while. Nothing about this process is fast. When you go to file your complaint, and if you bring a friend or witnesses, make sure you have at least 2 hours, per person that will be interviewed, to devote to being there. When you go to Internal Affairs, bring an official form of identification. If you don’t have one, they should still take your complaint, but we have seen complainants be discouraged from filing by being told they need ID, so be prepared to stand your ground on this. Once you have submitted your complaint in writing to the receptionist, our experience has been that the complainant will be summoned into an interview room to speak with an investigator. The investigator will ask the complainant to recount the events that led to the complaint being filed, and ask subsequent questions about what happened. Typically, an audio recording device will be used, and the complainant will be asked to give consent to be recorded. If you do not observe the presence of an audio recording device, you should ask why no audio record is being taken. We’ve had at least one complainant tell us that investigators did not record their interview, which means a complainant may have to spend time going back for an additional interview, or that the investigation may end up missing critical pieces of testimonial information from the complainant. Get a card and leave a trail. Make sure to get contact information for the person investigating your complaint. Ask for a card, and if they say they don’t have one, make sure to get their email address. As you communicate with Internal Affairs and other persons regarding your complaint, you’ll want to be keeping your own record of events; “how long has it taken between communications with investigators, what were their explanations for delays, etc.” If you don’t have it recorded or in writing, it might as well not have happened. So, be sure to create a paper trail. The best way to do this is by limiting all communications to email so there is a timestamped record. After the recorded interview, Internal Affairs will contact the complainant (usually within a few weeks) to come back to IA and review a written transcript of the interview between the complainant and the investigator. You will be asked to read over the transcript, look for errors, and initial each page once you have confirmed it for accuracy. If you are not contacted within a week of your initial complaint, we recommend you call and bother them about it until you get your next appointment set up. If there are witnesses, they can expect a similar process. First they will be asked to write a written statement, and then will be interviewed by the investigator. They will also be asked to come back and review their transcript. Once you’ve reviewed your transcript, the process becomes a wait-and-follow-up game. Investigators will set up similar interviews with any officers involved in the reported incident and conduct similar interviews with them as well. Once it’s all said and done, it can be months before you are informed of the outcome of your complaint. In one case, one of our organizers waited 7 months to get a letter from ISB. So, if it’s been a few weeks since you’ve heard back, don’t be afraid to contact them, and often. Sometimes bothering folks is the most effective way to get something taken care of. If you don’t hear anything back from your investigator, or if you experience other difficulties when filing your complaint, we’ve found that it is often effective to contact their superiors. Currently, the commander of ISB is Lt. Col. Jasper Clay. He can be reached at jasper.clay@memphistv.gov. It usually helps to CC other MPD Brass: Deputy Director Ryall: Jryall@memphistn.gov, Police Director Rallings: Michael.Rallings@memphistn.gov, as well as officials in the Mayor’s Office, Special Counsel to the Mayor: Alan.Crone@memphistn.gov, Mayor Strickland: mayor@memphistn.gov People move more efficiently when they know their bosses are watching, and remember you can always BCC the media. 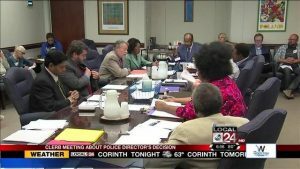 In November of 2015, Memphis United, a coalition effort, led by MSPJC celebrated a historic victory forpolice accountability and transparency with the passage of a stronger ordinance outlining the powers of Memphis’ CLERB, a board of civilians set up to review complaints of police misconduct when individuals are not satisfied with Internal Affairs’ findings. This was an uphill fight that took 3 years of organizing and agitating to win. Now, we are working with complainants to help them continue the process for accountability, and to document the barriers that people continue to face as they seek a more just city where individuals are treated fairly and equitably under the law.